Where would we be without this go-to, anytime breakfast/snack food? It’s not just for us granola-loving tree huggers. 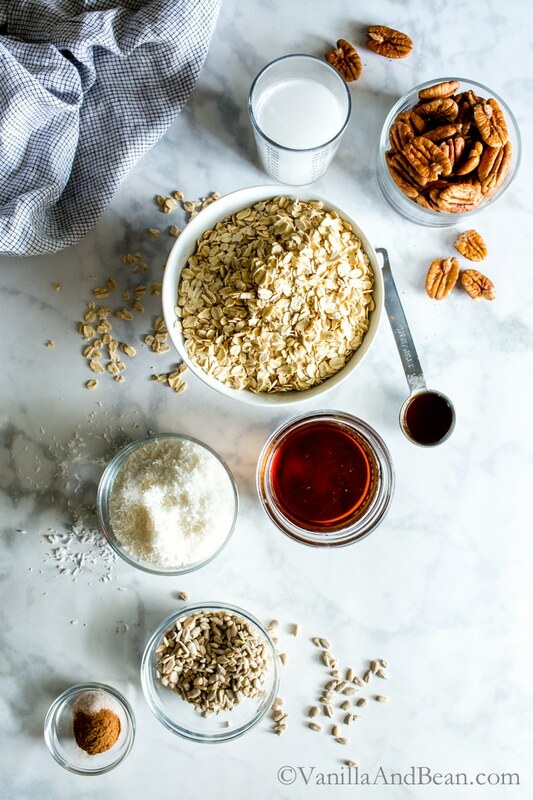 Maple Pecan Granola is such a simple, whole food and is so easy to make at home. It’s a pantry staple! I’ve updated the photography and tweaked the recipe every so slightly since first posting it in early Spring of 2014. It was one of my first blog posts on Vanilla And Bean and it was in need of an update. This particular recipe is one of Rob’s favorites so the granola jar is regularly stocked with it. He has breakfast after he gets to work and since granola is so portable, it’s an easy one to stuff into his lunch box. 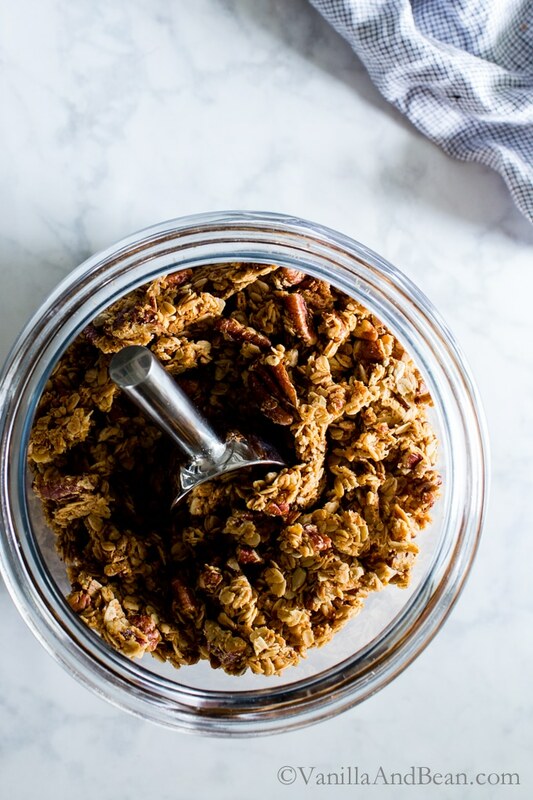 Maple Pecan Granola is probably the recipe I make most from the blog. I love having it on hand for road trips and hiking. It’s portable and stays fresh for such a long time. And just look how simple this is to pull together! Pecans, one of my favorite Southern ingredients, are high in dietary fiber and protein. They can be pricey however, so look for them in the bulk section. Whole grain rolled oats are another great bulk item. I keep an eye out for sales and stock up when these items go on sale. Maple syrup is my sweetener of choice for granola and I use it exclusively for all the snack recipes in my Grab-n-Go Snacks e-book. It imparts an almost buttery flavor when paired with rolled oats and already buttery tasting pecans. You’ll love how this granola makes your home smell! The long, slow bake means that the aroma of the cinnamon, toasting oats, and pecans will linger. Everyone will wonder what you’ve baked. And next thing you know, it’ll be time to refill the irresistible granola jar. Stir the granola to throughly incorporate all the ingredients prior to baking making sure all the dry ingredients are covered in the wet ingredients. For optimal clustering spread evenly and press the granola in the pan before baking. Don’t be tempted to stir while baking. After baking, allow the granola cool completely before gently placing it in a storage container. The long, slow, low temperature bake allows the granola to dry out. This supports clustering and aids in a long storage life. Plus it yields a really nice crunch! Diced apricots or golden raisins pair well with this recipe. Gently toss them in after the granola is cool. The clustering will be reduced a bit, but delicious dried fruit will add new level of flavor and sweetness to the granola. If you love this recipe, you may also like the bold flavors of my Lemon Tahini Cashew Granola. Make homemade granola once and you may never buy store-bought again! Optional Add Ins: 1/2 cup of chocolate chips* (pre bake - see note). OR a few handfuls of chopped dried fruit such as chopped Turkish apricot, sour cherries, cranberries or raisins (post bake). Line a sheet pan with parchment paper and set oven to 275F (135C). In a mixing bowl, add the rolled oats, pecans, coconut, sunflower seeds, salt, cinnamon, and chocolate chips (optional). Set aside. In a spouted measuring cup, combine the melted coconut oil, maple syrup and vanilla bean paste. Stir. You will see separation. Pour wet ingredients into the dry. Using a wooden spoon or your hands, mix throughly, ensuring that each, individual dry ingredient gets some wet on it. Press the granola into the pan, in one even layer. Place the pan in preheated oven and bake at 275F (135C) for 1 hour. Rotate the pan, turn the oven up to 300F (148C), and bake for an additional 20-25 minutes. Do not stir the granola, or clustering will be greatly reduced. Remove from the oven. The granola will be golden and soft to the touch. It will firm up as it cools. Allow the granola to cool completely in the pan before transferring to a storage container. Doing this will ensure crunchy clusters. If desired, toss in your favorite dried fruit such as chopped Turkish apricot, sour cherries, cranberries or raisins. *For a flavor bomb, stir in 1/2 C of mini chocolate chips while adding the dry ingredients. This recipe was rephotographed March 2017. Adapted from Alton Brown's Granola Recipe on the Food Network. If you make this recipe, or any others on Vanilla And Bean, be sure to post it to Instagram, notify me @vanillaandbean and tag #VanillaAndBean! I’d love to see what you’ve made! Also, if you like my content, please consider sharing it with friends and/or family. Thank you! Hi Traci, Admittedly I have not made this again, since you’ve tweaked your recipe….but you have me so curious now, to do this again. I can see that you’ve doubled the amount of Coconut oil from your original, and I have no qualms about doing this too! I am curious though as to why you’ve done this. Excited to hear back, and so excited to give this a another go. Hi Jeff! Nice to see you pop in! Uppin’ the oil makes the granola cluster better. You can certainly nock it back to 1/4 cup, but it won’t cluster as much. I hope this helps and you’re doing well! LOVE those clusters, so you’ve sealed the deal! Thank you Traci for responding to my query. Loved this recipe!! I make it all the time for my family! Hi Barb! I do not. Please feel free to plug the ingredients into any recipe nutrition calculator you like! This recipe looks terrific, but I eat a whole foods/plant based diet – no oil. Thanks anyway! I love the adaptability of this recipe, I was short on pecans so added some walnuts, had to substitute pepitas for sunflower seeds. I don’t really like the texture of the coconut so left that out. It came out crunchy and chunky, mmmm. For dried fruit I had some unsweetened dried blueberries from nuts.com healthy and yummy. Love reading your adaptations, Renno! Hooray for walnuts and pepitas! I’ve done that too.. need to add some notes, but so glad you tried what you had on hand. AND it came out crunchy and chunky! Hooray! Didn’t the house smell amazing? Thank you so much for coming back and leaving a note! Day made! My first time using this recipe and I will differently make this again. It is yummy to my tummy. I added and extra cup of oats and included dry tart cherries during baking instead of at end. I also skipped the sunflower seeds and added a dash of maple extract. I experienced clumping with a half sheet pan. Next time I will add dry fruit after baking. Cherries turned into rock candy. I was googling how I can use maple syrup givened to me when a friend of mine moved overseas. I used walnuts instead of pecans and pine nuts instead of sunflower seeds, all from her pantry. I had to use a bit of olive oil since I didn’t have quite enough coconut oil left and I added cruising after. The granola clustered beautifully and bsolutely delicious! My teenage son couldn’t believe I made this! Thank you for the great recipe I won’t buy another box of granola again! Hooray!! Hooray! Love reading this Kima… homemade is so much better! Thank you for your note and sharing your subs – well done! I made the recipe but had ZERO clumping. I followed the recipe exactly except for the coconut. I used a cookie sheet instead of a cake sheet. Flavorful but I do love my clumps. Any thoughts? Hi Alison! Thank you for your note. I’m sorry you didn’t get any clumping. I’m not sure how excluding the coconut would affect the outcome. Did you press the granola into the pan prior to baking? Use thick or old fashioned rolled oats? Cool completely? I’ve not had any reviews tell me they didn’t get clumping. I make this twice a month and always have good clusters. I hope this helps. For the updated recipe I: Increased the maple syrup and coconut oil by 1/4 C each and omitted the brown sugar all together. I found the granola has richer flavor and improved clustering. I also increased the sunflower seeds and coconut slightly and increased the bake temperature from 260F to 275F. Is there supposed to be brown sugar in the unmodified recipe or not? Hi Stephanie! I’m sorry for the confusion. In the recipe, as written, there is no brown sugar. I added the note for those that had been making the recipe prior to the rewrite (modifications). I hope this helps. This is delicious! I didn’t add the sunflower seeds or any dried fruit. I would just say watch closely, as mine almost started to burn near the end. However, the caramel that formed on the bottom layer… yum!!! Hi Molly! Thank you so much for your note! So happy you enjoyed the recipe. Good for you, checking on it – as oven calibration varies widely! But that surprise caramel layer :D … Hooray! I agree, granola is a must for breakfast! I love this version with maple and pecans. Such a perfect flavor combination! This looks delicious! Granola is such a great snack! Rob definitely has great taste. I like maple flavored anything and love how crispy it is. Traci, I’ve been enjoying looking at your ebook. 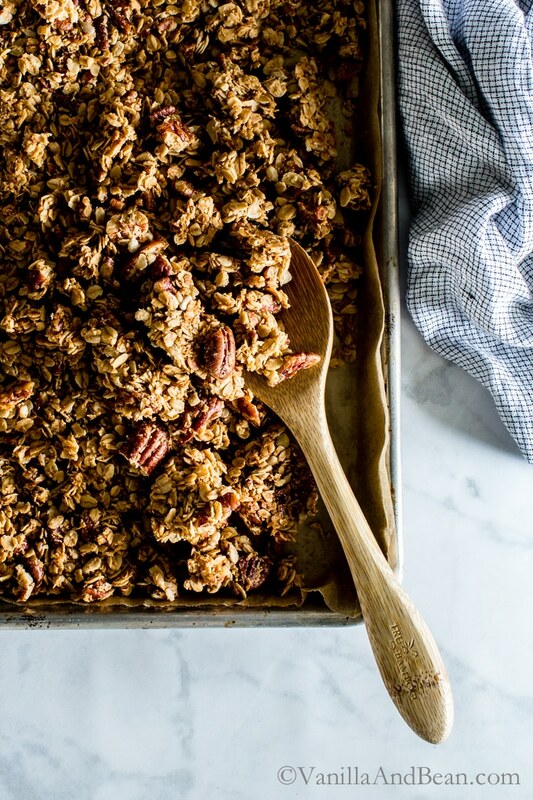 Bookmarked match bomb, another granola recipe…so many great ones. I find maple to be incredibly buttery.. I love it too Ash.. Yay! So happy you’re enjoying the ebook… Those little fat bombs are quite tasty.. sweetened too with Maple! Enjoy my dear xo ! Rob is smart! I’d love this too! and now I am thinking i need a road trip to see you and an excuse to make this, right? Thank you Amisha! I look forward to your new refreshers… coming soon!? Love the new photos Traci! And you know I’m a HUGE fan of your granolas! I’ll definitely be giving this recipe a try. I love having bags of granola around for easy snacking. Thanks for sharing and happy weekend! Awhh… thank you Mary Ann! Easy snacking indeed! Ooohhh…love the new photos! Granola is something I almost always have on hand as well. Especially when it’s sweetened with maple syrup! Enjoy your weekend, Traci! Hey Sue.. thank you for your note! I hope you enjoy the new version as much (if not more) than the old! So happy you’re enjoying the recipe! Looks absolutely delicious! I’ve been looking for new breakfast recipes, because plain oatmeal’s getting old. And I love that it’s all ingredients I have on hand – perfection! I hope you’ll give it a go Melissa! Isn’t it so fun when you already have all the ingredients?! Made this last night. Omitted Sunflower seeds as I didn’t have any on hand. Was very easy to make and the house smelled amazing. I had to stop myself from eating it all while it was cooling. The true test will be how much my 18 y/o leaves me today. I will make this again. Hey Linda, thank you for your note! SO happy you’re enjoying the granola. I make this recipe at least twice a month, we love it too! I hope your 18 y/o leaves some for you… perhaps a double batch is in order? My family now insists that we keep a steady supply of this granola in-house at all times. I’ve started pulling out my biggest bowl and doing enormous double batches whenever we run out. I use very dark maple syrup (it tastes more maple-y) and turn on the oven fan at a slightly lower temp. while baking… It turns my house into the best smelling place you’ve ever been and comes out crisp and delicious every time. Thanks a bunch! Hey Lucy! It’s the same here too! That granola jar is never empty – hehe! Double batches is smart and helps keep work to a minimum… and I’m with you on the dark maple – delicious! I just baked a batch this morning and the house smells SO good! So happy you’re enjoying the recipe and thank you for your note! New to your site! Made this granola a week ago and making it again today. We all loved it! Thank you. How fun to see this fabulous recipe take on a life of its own! Wow, 3 years after Traci published this, and still evoking comments….Way to go! Thank you for your note, Annie! Ours too! Best Granola I have made! Thanks for the recipe! Ooooh…I’m a huuuuuge granola lover too, Traci! We make it about once a week and love it on yogurt or sprinkled over peanut butter apple slices…so good! But…I”m with you…my favorite is right out of the jar! Love your recipe…pecans are so flavorful, they must be awesome in this. Can’t wait to make this! OH…and guess what? I have that exact same little bowl with the sweet bird on it! It’s so special to me because I saw it when I was out shopping with my daughter and just loved it! So, she surprised me and when back out to buy it for me! It’s precious! Isn’t it the best Caroline? Such a simple, whole food snack. I love how well it holds up… for weeks, if it lasts that long! hehe. The pecans really shine in this recipe. I love the sweet undertones they add. I hope your family loves this as much as we do. I’ve been looking for a Granola recipe. I used to eat it as a child. Looking forward to making this recipe! You won’t be sorry. This is about the best rendition that I’ve ever made. Hi Mary! You can completely leave the nuts out and add either more oats, coconut or other seeds such as pumpkin or a combination to replace the nuts. I hope you enjoy the recipe! This was sooooo good. Made it this morning. Our kitchen smelled delish. Super easy and we had all of the ingredients. Had myself a bowl of still warm granola with Traci’s “Cashew Milk” recipe, also made fresh this morning. Everyone likes it. Will use it on yoghurts, with mylks and for my to make açai bowl this week. Thanks for the lovely recipe Traci! Am looking forward to my newsletters bringing me other mouthwatering recipes and heaps of inspiration. We thoroughly enjoyed…no, make that RAVED over this granola. Traci may have begun with an Alton Brown recipe, but has clearly made it her own. This had the perfect amount of sweetness and by that I mean, not overly so. For the fun of it, I used an old fashioned hand nut grinder like my grandmother used to use for all of her nut chopping. My pecans may have been less coarse than the recipe dictated, and additionally, there was a good amount of the Pecan “powder” that formed. I used all of it, and the Pecan flavor was intoxicating in every bite. Additionally the Coconut oil instead of a typical vegetable oil was brilliant. I’ll be putting those pecans in the food processor on my next batch of granola. I’ll also keep my eye out for an old fashioned nut grinder. Thank you for the tip! So happy you enjoyed the granola! Thank you, Traci, for this quick, delicious, wholesome snack! I can’t wait to smell it cooking and have it standing by for nibbling. Keep these jewels coming!